Professional data recovery prices are not usually cheap. 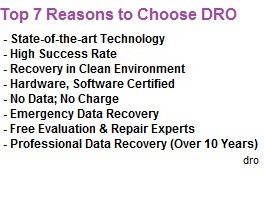 Top reasons are expensive technology and its maintenance, the amount of time data recovery can take, research and experience. There are many kinds of prices available in the market but it is very hard to tell who is best in the industry. Professional data recovery labs always make their price based on their ability to deal with data recovery cases in a professional way. They would definitely have the best technology, proper clean environment, certified technicians with lots of experience. Cheaper price does not mean the service will be the best because the price is reflects several facts mentioned above. All these facts also contribute to high success rate. There is always a chance to recover a drive if it is done by professionals but there is only one chance if it goes to wrong hands. High success rate depend on few things like following proper procedures and practices combined with experience and use of professional tools. This means cheaper is not always the option unless a professional data recovery company offers affordable prices. We offer the best and affordable data recovery and hard drive repair service in Toronto, and all other cities and regions of Canada. We have the best data recovery and repair technicians who are experienced, multi vendor certified, have the patience to perform well when dealing with difficult cases, state-of-the-art technology, clean environment which results in high success rate. We offer free evaluation and free computer repair (parts not included) in order to bring a computer back to the state when it died. Please ship or bring your media to our data recovery lab. Data recovery prices vary depending on the situation. Prices are set differently for software and hardware recoveries. Industry prices for data recovery mostly start at $300.